I have created a repository of my bubble/social speech layout, so if you want to have a closer look and implement it yourself then you are free to go. In order to have icons I updated my LotusScript agent to add a URL to an image in the PhotoURL field of the Person form in the FakeNames.nsf. For now I stored the icons in the NSF but in case you have a directory you use the reference to images from there. I have also added an updated version to Like/Unlike comments, in stead of SSJS now most of the logic resides in the LikeController class. When you hover over the icon you get a list presented with people who have liked the comment. Ofcourse nothing is stress-tested but I have not seen major issues so far. I hope you like it and get inspired to modernize your IBM Notes applications ! You can 20 years of experience within IBM Notes and Web development to your workforce by hiring me. Interested? Read my curriculum vitae on LinkedIn: http://www.linkedin.com/in/patrickkwinten and get in contact. I am happy to work WITH you ! In the old days you a typical commenting feature was something with a form and a view. Typically you could read a list of comments in a historical (flat) order and on the bottom you had the form to enter your comment. 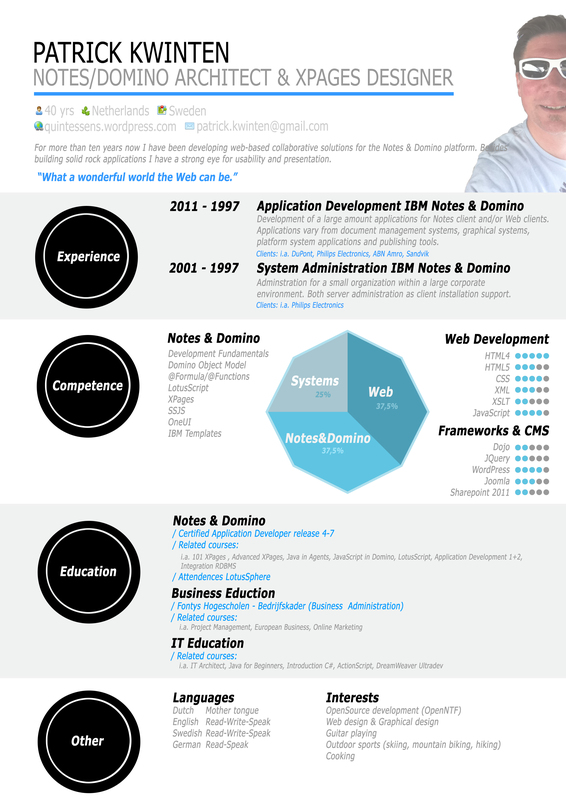 Something like in the IBM Domino blog template. With the rise of social and mobile it became more important to be able to comment-only so the form moved to the top and the list of comments became sorted in the opposite order (Youtube). Discussions are still displayed in a thread but since threads are less friendly on a mobile device a more what’app like chat display. But these are more instant messaging apps, similar to Slack or IBM’s upcoming Toscana. So what can/should we do to modernize the display of the comment feature in our Notes/XPages application? Well mainly we still have a top level object (TLO) where people comment on. To stimulate people to comment the form should be close to this TLO. We can promote the interaction between a user and others and provide some form of “bubble speech” experience and (ofcourse) the option to “like” a comment. Notice on the left you see the comments I have made and on the right comments made by others. The latest comment is displayed first and mines are a bit more outstanding using a background-color. Note that in a previous post I described how to add @mention autocomplete like Facebook, Twitter & Google+ to your XPages app. So I will not discuss in this post how to build the form to comment. First I have a repeat control which is bound to an ArrayList containing JsonObjects. This approach you can find in my Bildr project on OpenNTF (shameless plug). I also added an infinite scroll function. You can read about how to set that up in this post. The panel has a computed styleclass. The style defintion “right” does nothing more than a text-align: right. This makes sure the text in the content is … aligned right. Humans are visually oriented and idle so nothing wrong making our display attractive with a user icon. In this example I am just displaying some random icons, but if you have a corporate directory with user profiles containing icons you should embed them here. The pull-left and pull-right classes are from Bootstrap. My comments are pulled to the left, comments from others to the right. Next item that we add is a div with a media-body class. It contains out of 2 sections: the content of the comment (text written) and some meta-data (date, author). I also added a “like” link which is inspired by Thomas Adrian’s Intrapages app also available on OpenNTF. First I display the Author name, only for comments written by others. In order to make the date more human friendly to read I am using PrettyTime. In the past I have blogged about how to use it. For the “like” button I would like to point to Adrian’s example in his Intrapages project. I made however the exeption to store the likes in a separate document, so not in the comment. By this way I can tighten my security model. Everybody has the role of [liker] and author access. So everybody can update a like document and not the original comment document. But beware that the cookie still exists when users logout and login with a different username-password combination !! So I have a counter for the number of likes, and depending on my activity I have a like or unlike link. After we have added some more (basic) CSS we are done! As a result we have created something much more modern that the old school comments display as we know from the IBM Domino Blog template. If you are interested and want to receive the details of this setup I welcome you to send me a message and we can exchange code. Btw, all links were collected from this source.